2) Is it reasonable to assume I can service it myself? I've done numerous automotive jobs (I rebuild manual trannys in my spare time), but I've got no diesel or ag experience. Are factory service manuals and parts lists for all the major brands? 3) When looking used, how many hours would you say a tractor a) might need the engine rebuilt b) definitely needs the engine rebuilt? 4) In buying used, any quick tips on things that are particularly expensive/difficult to fix? The gotchas that most buyers might overlook? Thanks again. The answers to my last thread were very helpful. In tractors FWD generally means 4WD. It's not as sophisticated a system as on 4WD trucks but all four wheels pull. Working on your own isn't rocket science. Of course you need the skills, tools and documentation to do the job. Simple jobs are easy, bigger jobs may well require specialized tools or equipment. To me the key would be getting the factory technical manual. JD's manuals are very detailed (and expensive) not sure about other brands. Rebuild hours depends on so many variables it's hard to give a canned answer. A diesel engine that runs for hours and hours without being shut off may be be in far better shape than one that is constantly started cold and run for short periods. Most homeowners probably are in the latter category. As a guess maybe an "average" rebuild time would be 5000 hours with a standard deviation of 3000 hours. 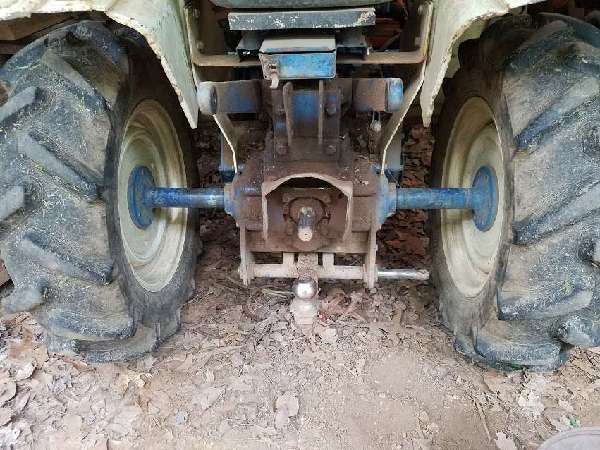 Probably one overlooked and expensive "gotcha" would be non-obvious structural damage, like a racked loader (out of square) or cracked axle housing. KW's right on the money about all points. Buying anything without investigating or research on certain models you're intrerested in is like buying a pig in a poke (which BTW is not the preferred way to buy a pig). So find something you like and google it until you get enough info to make an educated purchase. Tractors generally get an overhaul at 5000 hours. If the overhaul isn't performed on schedule, it's possible that the block could be destroyed......and that would be a VERY EXPENSIVE repair job. Figure putting about 100 hours on your compact tractor each year.....on average. This is a pretty good estimate. If you purchase a used tractor with 500 hours on it, you can figure on that tractor lasting you nearly 45 years.....with proper maintenance, and no surprises. Most people would never expect a car to last that long.....in fact even 20 years on a car is asking a lot. General rule of thumb....... stay away from any tractor that has over 2000 (thousand) hours on the meter. Many, many used tractors can be found with less than 200 (hundred) hours on them. "Tractors generally get an overhaul at 5000 hours. If the overhaul isn't performed on schedule, it's possible that the block could be destroyed......and that would be a VERY EXPENSIVE repair job." Joel, first off, where is it written that an overhaul has to be done "on schedule". And just where is this schedule? And please expound on your theory and the connection between "...5000 hours..." "...and block being destroyed..."
We live with the worst to keep an engine going! Cold and heat, it is very tough to get many hours on a machine with major temperature swings. The short term running is the worst, we've seen when engines are run constant far more hours on them then those who run them for short bursts and never get them warm. There is also the good oil vs the economy oils that people run. Any proper engine oil will take you to 5,000 hours on a diesel, good oils we see go over 10,000 hours on rebuilds. We've seen engines get into the high teens before a rebuild under good operation of the tractors. I've sen tractors that look like junk, but run like a swiss watch because of the maintence that it did have, and we've seen them that look like new that need rebuilding with low hours. We just had a tractor in that is twenty plus years old with only 650 hours that needed to be rebuilt. The cylinder sleeves were glazed over from not maintaining the engine temperature while running. I don't ever think this engine really broke in! There are exceptions to the rule. There always are. For example, the U.S. Coast Guard recommends an overhaul on the ALCO 251 marine diesel propulsion engine, operated on Reliance class cutters, at 24,000 hours. Agriculture Tractors have a 5000 hour life expectancy, due to the extremely dirty environments they operate in. Data is gathered from nearly every major facility, in order to establish a standard....and the standards do change from time to time, as the equipment gets better, and the data collection improves. Computers have greatly increased the speed in which the data is being collected. This allows for much faster revisions in the scheduled overhaul intervals. Having been an automotive technical writer in a former life, the only schedule we published was dictated by the engineers based on empirical data from "bench-testing", real-world test data, surveys, warranty claims, etc.---not a third party. So I have nothing to refute your last reply, but what about "destroying the block"? And I don't agree at all with your statement about a 5000 hrs life expectancy either. (At the risk of misleading newbies) you are suggesting after 5000 hrs you simply dispose of the engine. Not true. What you should say is that generally, and with exceptions, life expectancy before a total rebuild may be 5000 hours, or words to that effect. The whole idea behind scheduling a rebuild, at a specified number of hours, is to prevent any serious damage from occurring, which would then require an engine replacement. If an engine is overhauled prior to noticing any serious damage, it's most likely not going to need much more than bearings and rings......along with a valve job. Diesel engines might last far longer than 5000 hours, but if a bearing spins, or a rod breaks, rebuilding it may no longer be possible.